I awaited the arrival of my review copy of Bollywood Kitchen with a wee bit of trepidation: my experience has been that many books like this end up frothy and insubstantial, good to flip through for a bit of a lark, and then relegated to a bookshelf to languish. I was absolutely delighted, however, when the book arrived and totally tore down all my preconceived notions about what it would be like. 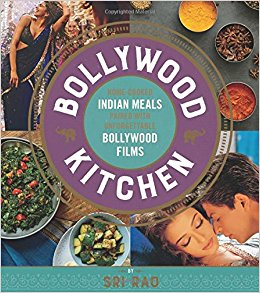 Its author, Sri Rao, is a Pennsylvania-born “filmmaker, author and lifestyle expert”, and he brings his experience as a writer and producer to the creation of Bollywood Kitchen. Sri Rao sees himself as someone who bridges cultures, and I feel that is reflected in his book. The recipes are designed to reflect Indian home-cooking, inspired by Rao’s mother’s recipes, but they also recognize the kinds of adaptations needed when ingredients were less widely available then they are today. So Rao’s recipes are, in some ways, more representative of the ways Indian home cooking has evolved in the North American context. The recipe for keema is a great example of this: it’s a curry dish traditionally made with mutton, but Rao describes how his mother adapted it for ground beef “to create something that feels familiar and comforting to us as Americans”. I will confess, I’m not particularly a fan of ground beef, and I’d probably substitute ground lamb next time I make it. Even my husband was surprised that I’d stuck to Rao’s recipe (well, however would I be able to test and comment on it if I hadn’t? ), but it was really tasty. Many of the recipes are designed to be easy to make, and rely on tinned legumes or pre-cut, prepared items in order to speed up cooking, always a consideration for busy lifestyles. While I concede that it speeds up the process, I didn’t love the texture, for example, of the tinned chickpeas in the recipe for chana masala (I’m used to making my own from dry in the pressure cooker). However, in terms of flavour, it really was one of the better recipes for chana masala that I’ve tried. I want to emphasize, here, too, that although there is an attempt to make most of the recipes easy and accessible, particularly to non-Indian cooks, there isn’t any dumbing down of the cookery. Yes, many of the ingredients will be available in your local grocery store (even mine occasionally has things like fresh curry leaves), and yes, some of the ingredients will require a trip to an Indian grocery. But Rao keeps the more challenging ingredients to a minimum, and recognizes when he’s including a recipe that might be more difficult to master (such as that for dosas). Rao brings this same meticulous approach to his recipes to the films selected for the book – he notes in the introductory material that he started with a list of about 200 films that he eventually culled down to the selections for the book. He is clear in his selection process for the main films he features: contemporary films only (no classics) starting from around the mid-1990s. Films available with subtitles. Films from a variety of genres (romance, suspense, art house, action, comedy). Films that represent a range of actors and directors. The contents of the book are organized around the idea of “dinner and a movie”. Rao selects a film, gives you some insight into it, and then presents a set of recipes inspired by it. Many of the films fall into the category of “usual suspects” – so, for example, you’ll find Devdas, 3 Idiots, Kuch Kuch Hota Hai, and Dil Se. But Rao doesn’t stick to the obvious choices, so alongside those you’ll find Dor, Gangs of Wasseypur, Queen, Haider, Piku and NH10 (amongst others). But he doesn’t stop there – for each of the main movies he selects, he also offers up suggestions for other films to watch. So, for example, if you watched Piku, starring Deepika Padukone and Amitabh Bachchan, Rao invites you to look back to several of Bachchan’s earlier films, including the iconic Sholay and Deewar. Dor (a remake of the Malayalam film Perumazhakkalam, and one of the rare remakes I think is actually better than the original film) allows for a discussion around parallel cinema and recommendations for Mr. & Mrs. Iyer, Raincoat, and Ijaazat. Bollywood Kitchen is a must-have for anyone interested in both films and Indian cookery – to the credit of Sri Rao (and his publisher, Houghton Mifflin Harcourt), there is a great balance between both the book’s themes: you really do get ideas for dinner and a movie, and the quality of one is not sacrificed for the sake of the other. The book is well-organized, and beautifully designed, with lots of photographs to accompany the writing, to whet your appetite for both the food and the films. 15 queries in 0.363 seconds.